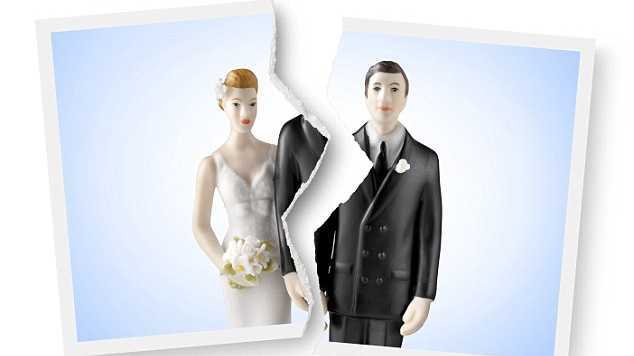 The bride-to-be e cancelled her wedding because guests refused to give her $1500 to attend. 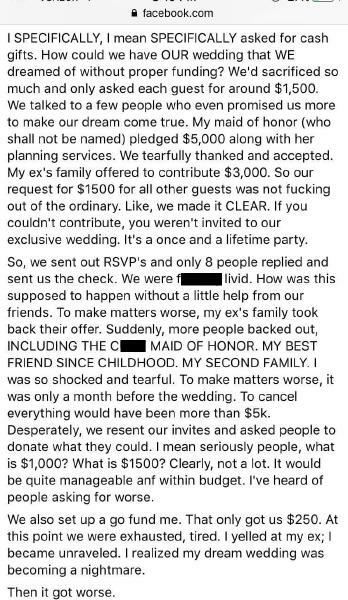 A BRIDEZILLA in Canada has disowned friends and family in a foul-mouthed Facebook rant after she cancelled her $60,000 ($A62,800) wedding because guests refused to give her $1500 ($A1570) to attend. The unbelievable story went viral after shots of the bride's ridiculous rant were posted to Reddit. 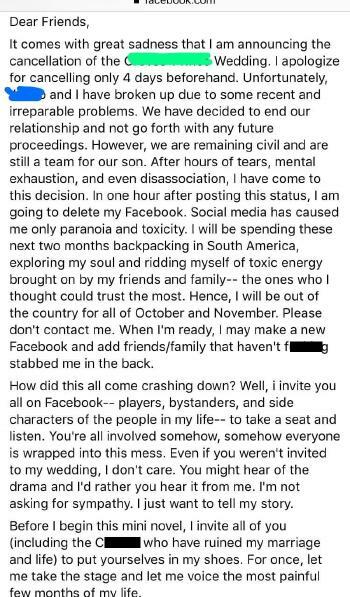 The bride, Susan, took to Facebook to announce the cancellation of her wedding four days before the event, blaming guests for not funding her Kardashian-style wedding. The post is very lengthy so here is a quick rundown if you don't feel like reading the whole thing - but I really recommend you do as it is totally worth it. 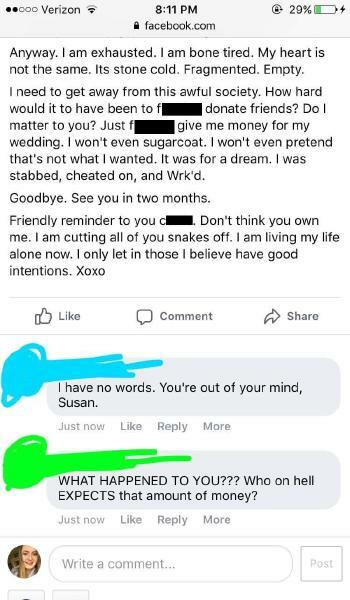 It starts with Susan announcing the cancellation of the wedding and that her and her partner have split due to "recent and irreparable problems". 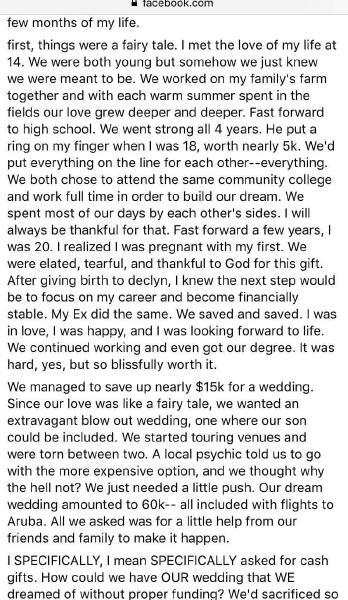 She then goes on to explain how she had always dreamt of having a huge "blowout" wedding but as her and her partner had only saved $15,000 ($A15,700) they turned to their guests to fund the $60,000 event. They told guests they had to send $1500 if they wanted to be invited to the wedding and were absolutely shocked when hardly anyone coughed up. "I SPECIFICALLY, I mean SPECIFICALLY asked for cash gifts," she wrote. "How could we have OUR wedding that WE dreamt of without proper funding? 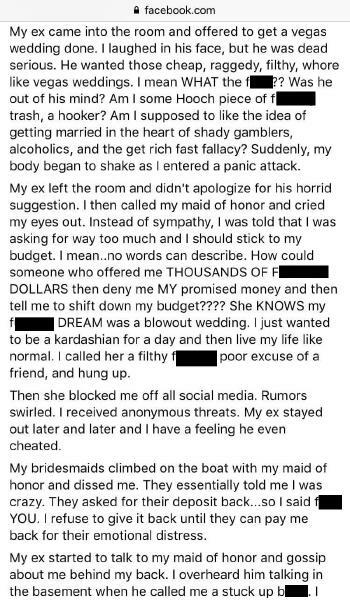 Eventually all of the bride's friends and family turned on her, including her fiance, over her obsession with having a huge wedding. Read the full post for yourself to really experience it in all of it's bridezilla glory.